I put the quotes by Joseph regarding keys at the front of this post, and am following his quotations with the article published in the Encyclopedia of Mormonism by Alan Parrish. I do this to illustrate that the word keys can be nuanced at times. Like many words and ideas expressed by the Prophet Joseph Smith, the idea of keys developed over time as he was taught from on high and grew in his understanding. The Lord expressed the idea of keys differently to him over time as Joseph learned more of the mysteries of the kingdom of God. D&C 90:1-5; 124:34 and 128:11 are a great starting point regarding the concept of keys as Joseph taught about them in the Nauvoo period. As I read his thoughts regarding keys in this time period, I see his thoughts more expansive, more inclusive to those who are ready to receive, indeed, his inclusion of the whole church, when it comes to keys as he taught about them in these later years. The keys of the priesthood refer to the right to exercise power in the name of Jesus Christ or to preside over a priesthood function, quorum, or organizational division of the Church. Keys are necessary to maintain order and to see that the functions of the Church are performed in the proper time, place, and manner. They are given by the laying on of hands in an ordination or setting apart by a person who presides and who holds the appropriate keys at a higher level. Many keys were restored to men on earth by heavenly messengers to the Prophet Joseph Smith and Oliver Cowdery. The keys of the kingdom of God on earth are held by the apostles. The president of the church, who is the senior apostle, holds all the keys presently on earth and presides over all the organizational and ordinance work of the Church (D&C 107:8-9, 91-92). He delegates authority by giving the keys of specific offices to others (D&C 124:123). Only presiding priesthood officers (including General Authorities, stake presidents, mission presidents, temple presidents, bishops, branch presidents, and quorum presidents) hold keys pertaining to their respective offices. Latter-day Saints distinguish between holding the priesthood and holding keys to direct the work of the priesthood: one does not receive additional priesthood when one is given keys (Joseph F. Smith, IE 4 [Jan. 1901]:230). 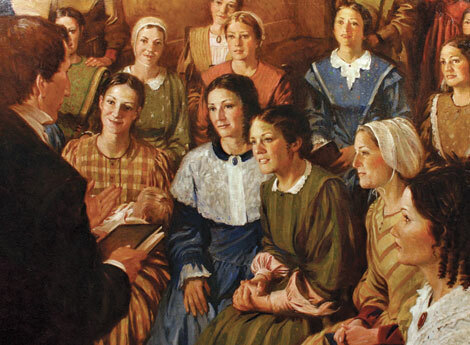 The Prophet Joseph Smith taught that “the fundamental principles, government, and doctrine of the Church are vested in the keys of the kingdom” (TPJS, p. 21). “The keys have to be brought from heaven whenever the Gospel is sent”; they are revealed to man under the authority of Adam, for he was the first to be given them when he was given dominion over all things. They have come down through the dispensations of the gospel to prophets, including Noah, Abraham, Moses, Elijah; to Peter, James, and John; and to Joseph Smith and the designated prophets of the latter days (HC 3:385-87). Keys to perform or preside over various priesthood functions were bestowed upon Joseph Smith and Oliver Cowdery by John the Baptist (see Aaronic Priesthood: Restoration), by Peter, James, and John (see Melchizedek Priesthood: Restoration of Melchizedek Priesthood), and by Moses, Elias, and Elijah in the Kirtland Temple (see Doctrine and Covenants: Sections 109-110). Many types of keys are mentioned in the scriptures of the Church (see MD, pp. 409-13). Jesus Christ holds all the keys. Joseph Smith received the keys pertaining to the restoration of the gospel of Jesus Christ (D&C 6:25-28;28:7;35:18), and through him the First Presidency holds the “keys of the kingdom,” including the sealing ordinances (D&C 81:1-2;90:1-6;110:16;128:20;132:19). Specific mention of certain keys and those who hold them include the following: The Quorum of the Twelve Apostles exercises the keys “to open the door by the proclamation of the gospel of Jesus Christ” in all the world (D&C 107:35;112:16;124:128). Adam holds “the keys of salvation under the counsel and direction of the Holy One,” and “the keys of the universe” (D&C 78:16; TPJS, p. 157); Moses, “the keys of the gathering of Israel” (D&C 110:11); Elias, the keys to bring to pass “the restoration of all things” (D&C 27:6); and Elijah, “the keys of the power of turning the hearts of the fathers to the children, and the hearts of the children to the fathers” (D&C 27:9). Holders of the Melchizedek Priesthood are said to have “the keys of the Church,” “the key of knowledge,” and “the keys of all the spiritual blessings of the church” (D&C 42:69;84:19;107:18), while belonging to the Aaronic Priesthood are “the keys of the ministering of angels, and of the gospel of repentance, and of baptism by immersion for the remission of sins” (D&C 13:1;84:26). All these stewardships will eventually be delivered back into the hands of Jesus Christ (TPJS, p. 157). This entry was posted in Joseph Smith, Priesthood and tagged Endowment, keys, priesthood, Relief Society, Temple. Bookmark the permalink.